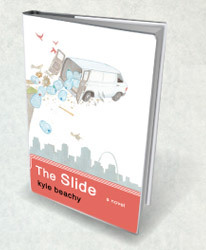 And that’s why today The Slide becomes only the fourth book in CCLaP’s history (and the first this year) to earn a perfect score of 10, and why in my opinion it wouldn’t surprise me at all to see this get a dark-horse Pulitzer nomination come next year. It’s one of those books that makes you feel all funny and sad and strange afterwards, one of those books that inspires cults among 23-year-olds…What a treat this book was, a truly unexpected treat, and what an astounding future Beachy has in store for himself as an artist. I recommend jumping on the bandwagon yourself as soon as possible. After one full day as a baseball blogger, I have decided the position does not suit me, mainly for the, um, rigor? Of the position? The sheer number of games and so on? Crap, man, one-hundred-sixty-two is a whole lot of games. I’m frankly shocked I lasted this long. Today I am making a commitment to write something about each Cardinals baseball game this season. I am more accurately going to try very hard to write about every game, but I will miss some and others might not appear before the next game, they could be out of order and or contain sly bits of disinformation. I could also abandon the project completely at any point. Perhaps I’ll include writing on other baseball related items like the shitass potholes all over the city of Chicago. And the Oakland Athletics. not a great game out of motte. Welcome to professional baseball opening day Jason Motte! You sure blew that one real hard!